The Hallicrafters SR-2000 is a vintage discreetly wired radio. Like many others of that era the routing of the wiring and location of components was not always exactly the same as the design prototype. As a result, each of these radio's had a slightly different personality. The information within this site is an effort to define the variations that result in different behaviors and provide methods to correct them. This note addresses a frequently occurring 300Mc oscillation pulsed at 1.9Kc. Symptoms include a very low level pitch from the speaker, sounding to be approximately 1.9Kc and a very ragged swept wave form when aligning the 1st I.F. system or using a scope anywhere else in the radio. 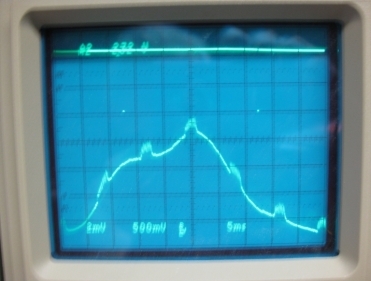 The following photo's will present the waveform when aligning the I.F. system and the two capacitors that need to be moved apart. The separation need only be 1/4 inch. 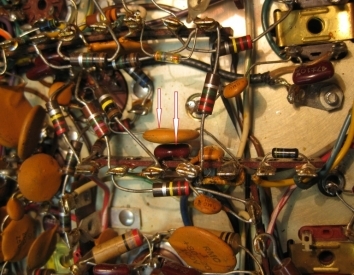 Note the two arrows pointing to the Ceramic C198 and Mica C208 capacitors. 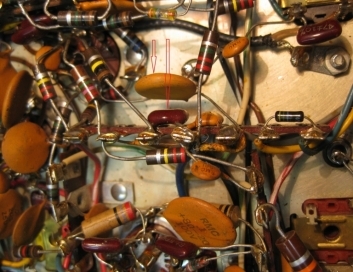 Their proximity causes the receive audio tube V19, a 12AT7 to oscillate --- yes at 300Mc. Waveform when trying to align the 1st I.F. Note the bursts of oscillation. Moving the capacitors apart corrects the problem.